TimeZone : Public Forum » In your opinion, what type of watches do you consider Haute Horlogerie? When it comes to definitions, we know how it goes - it depends on who we ask. So, to you, what characteristics of a watch do you consider necessary for it to be a Haute Horlogerie timepiece? -Can a tool watch like Omega Speedy Moon or Daytona qualify? Hand finish on the mov't? Shininess? I first considered complications but I don't consider a Seagull with a Tourbillon Haute Horlogerie, so I don't think complications are the definitive answer. In my humble opinion it comes down to one thing: Finish. Something like a Simplicity doesn't have an over the top complication but it is certainly, in my opinion, Haute Horlogerie. The same goes for something like an Eichi. At what point does the watch go from nicely finished to 'Haute Horlogerie' I'm not sure. For example, I don't consider all Pateks to be Haute Horlogerie but many certainly are. Patek varies in their level of finishing where I find far far less deviation in (for example) Lange's line which I would consider more universally Haute Horlogerie. But that's one man's ramblings. ...it more than qualifies, as do most things by Laurent Ferrier, Kari Voutilanen, Roger Smith etc, etc. Hand finished to the highest level it most definitely deserves to be called Haute Horologie. or very limited edition pieces of "art" watches. However from these experimental pieces come advances in design and engineering that find their way into mainstream watches. Another anology is "dream" cars or experimental cars seen at international car shows and from these we see what is in the works coming in the next few years. ...that's nice, now get off my lawn. The Omega Speedy Moon and Daytona are respected timepieces from more or less respected brands, possibly more from their historical significance and longevity than anything else but the watches are not in any rational sense of the term Haute Horology; the watches are more pedestrian than haute. I do not like (read hate) the term Haute Horology—rather I like what Cartier called a recent collection: Fine Watchmaking Collection—see the Cartier skeleton, tourbillon, perpetual calendar, single push-piece chronograph pocketwatch pictured. The term Haute Horology is fraught with connotations related to Haute Couture, jewelry and fashion. I think Fine Watchmaking is a more apt term and a term better able to be defined within the context of horology and Haute Horology should be relegated to the dustbin of history. I think (for whatever it's worth) the Fondation de la Haute Horlogerie (FHH) uses the term Fine Watchmaking—which is odd given the group's name. It is so, so stunning. I already can't get it out of my head. You better finish it and not make everyone muller over what you mean! and I probably can't afford it. Both Rolex and Omega design their products to a price, and few limited editions apart, they aim for mass market. Mass market here meaning relatively large market in the realm of high quality mechanical watches. That's still tiny compared to what mass market means in many other industries, but that's beside the point. 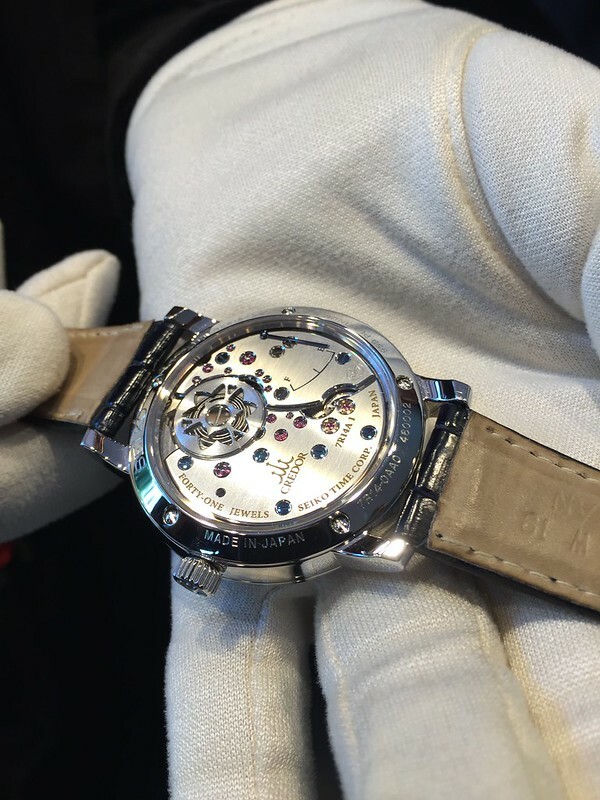 Haute Horologie is the cost-be-damned, only-the-best-will-do approach to watchmaking. It produces super exclusive watches to those who can afford them, and holy grails to us who can't. 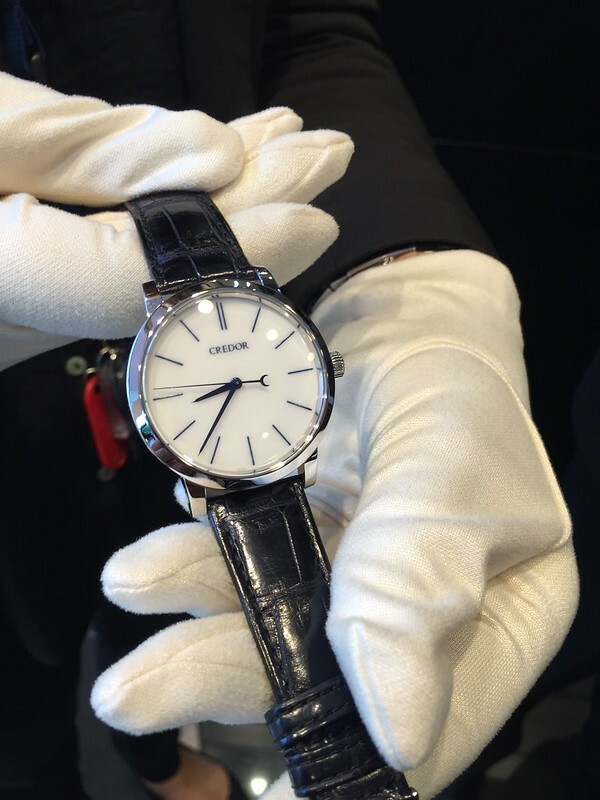 The watch industry should know: every year a huge watch fair, the Salon International de la Haute Horlogerie, is organized in Geneva, the watch capital of the world. So the watches shown there, the competing watches of other brands, and everything considered better, should be called haute horlogerie. As such, Rolex and Omega should be considered haute horlogerie. Narrowing down the definition to the absolute top level, where watches cost at least CHF 50.000 and often much, much more, is a self imposed snobism which in my opinion is uncalled for. So, great, I own some watches that are part of haute horlogerie, that really makes my day. I'd say anything with a unique movement, a cool complication, and an eye-watering price tag qualifies. A lot of it is in the eye of the beholder. So many tourbillons and "grand complications" qualify. I am not saying they are always aesthetically pleasing. And price alone is not a valid entry point. At least to me: it is not so much "Narrowing down the definition to the absolute top level" rather by established definition haute anything is associated with the crème de la crème of the thing. Democratizing so-to-speak the term haute dilutes the term to meaninglessness. I do not think one needs to be a snob to appreciate that a Vacheron Constantin Traditionnelle 14-day tourbillon (I do not own) is haute horology and a Rolex Datejust (I do own) is not—as much as as I think the Datejust is a really wonderful, historical timepiece I do not consider the Datejust Fine Watchmaking. As soon as you ask for definitions based on opinions you are in trouble. So I may agree with you or not, without real consequences. To be sure, the lower level of the SIHH-type watches is still a very high level, when compared to the level of the huge majority of the watches produced. All watch companies at the SIHH-level, including Rolex and Omega, take care quite a bit about their watches, they make sure the movements, cases, dials, hands are finished at a most appropriate level, the make sure that every part is functioning well, these companies have high-set quality standards. These watches carry a price that many buyers of a watch are not prepared to pay. Yes, to me it is haute enough, haute horlogerie. Is the Matterhorn high at 4800m? Or are only the Mount Everest type of mountains high at 8000+ m? When having a high class holiday in Switzerland and I look at the Matterhorn, it is high: high enough for me. ...but that doesn't make a Rolex Submariner or a Omega Speedmaster - or even an IWC Ingenieur - haute horlogerie. I explained why I think "SIHH-Rolex-Omega-level" is haute horlogerie, at least in my book. You saying it is not, Rolex Submariner, IWC Ingenieur, can only be understood, at least by me, if you explain what your definition of haute horlogerie is. I googled the term, there seems to be no general definition of haute horlogerie, so it is up to an opinion, where it is interesting to know what the criteria are, and how they are adhered to by different brands. To state in other words: rather high is also high, extremely high is certainly high. To me, the top 15% is high. Rolex, Omega, Breitling, the more accessible offerings from JLC, IWC, GO, Grand Seiko, etc - these cannot be considered to be haute horologie. From the non-independent brands, this leaves us with the higher-end JLC, IWC, GO and GS/Credor, etc offerings (as an arbitrary criterion, those exclusively Au or Pt cases). I'd suggest that any watch from the likes of FPJ, Moser, and other top independents also qualifies. Possibly also the Nomos Gold (Lambda, etc) series. Anything containing bits from the Titanic is automatically disqualified. what I consider to be haute horlogerie, Paul, in my initial post in the thread the one showing the 5 watches produced per year Credor Eichi II. That being the case, a Submariner, Speedmaster, Ingeneiur, GS SBGE001 etc could never be considered haute horlogerie, while Credor's Eichi II, Laurent Ferrier's Galet Classic Double Hairspring Tourbillon, Dufour's Simplicity, Voutilianen's Vingt-8, Roger Smiths' Series 1-4 etc, etc. Not Lange, Not Patek Philippe, not Journe, not AP, not Cartier—I admit that is a little clickbait—well at least not the models pictured—I've owned and worn daily all these watches and never once did I, nor do I now, consider the watches haute horology; yes of course the watches are really nice but to be honest the watches are not mind-blowing tours de force, even the Journe though I think the Journe is the nicest of the lot. For all intents and purposes and with all sincerity the watches are more or less quite expensive jewelry if not toys. As already mentioned watches like the Eichi I, Eichi II and Patek 5270, Vacheron Traditionnelle calibre 2755, Cartier Crash skeleton reach the Mount Olympus of fine watchmaking (at least to me) not bread and butter offerings from the holy trinity and its brethren. I think haute horology, fine watchmaking what-have-you should breathe rarefied air. I may have to rethink my opinion of the Journe as I do miss the watch. Above everything else, extremely high quality. Everything must be as close to perfect as possible. - Design: something that stands out, but without being outlandish. - Materials: Platinum, gold (as close to 24K as practical), exotic leathers, experimental metal-matrix composites. Haute Horologie is a term derived from Haute Cuisine and Haute Couture. In each case it means the absolute High-End created with time-consuming manual working methods and attention to detail by the most renowned artisans. For Haute Couture there is actually an organization in France that decides which fashion houses are allowed to advertise themselves as Haute Couture. The requirement for cost-no-object artisanal production approach excludes industrial scale producers like Rolex, Omega, IWC etc... They are not Haute Horologie just like ready-to-wear clothes even from expensive labels are not Haute Couture. To clarify my post above, while most watches IWC makes are industrially produced high quality watches, but not Haute Horologerie, every now and then IWC produces custom order watches that qualify as Haute Horologerie. A good example is the Portugieser Sidérale Scafusia. Portugieser Sidérale Scafusia may be a technical marvel but at least to me the watch is not haute horologerie as to the best of my knowledge which I admit is minimal at best and zero at worst the Portugieser Sidérale Scafusia's movement is not finished (horological decorations) to the standards I would consider haute horologerie—I could be quite mistaken about the finishing so I appreciate correction to my assumption. I guess the materials used in the Portugieser Sidérale Scafusia could be technically advanced to the point that horological decorations may not be applicable; if that is the case I still would not consider the watch haute horologerie. I do not consider technical innovation/mastery as accomplished as it may be to singularly define haute horologerie. I think the IWC Portugieser Tourbillon Hand-Wound is more "haute" than the Portugieser Sidérale Scafusia for a 1/10 of the price. I think the Portugieser Tourbillon is as beautiful as the Sidérale Scafusia is ugly. In the picture below there is the caliber 94900 (Sidérale Scafusia) and the 98900 Calibre (Portugieser Tourbillon Hand-Wound)—can an IWC aficionado confirm the difference in finishing? I am not saying the seemingly lack in extreme decoration detracts from the significance of the watch but such a lack is not haute horologerie as I understand the term. The above is really just food for thought and I appreciate comments. Each Siderale Scafusia is made to order. According to IWC, the client can pretty much custom order it the way he wants. If I've understood correctly, the final finishing of the movement will be more or less whatever the client wants it to be. Anyway, imho, a highly ornamental decoration on movement does not necessarily make it better finished than a fairly austere looking, but painstakingly finished movement. The reason I consider it to represent Haute Horologerie is the approach IWC has taken with this watch. It was designed by a team of highly respected experts. It is a technical tour de force representing the absolute high-end of watchmaking. It is hand-built to a very high standard, and the fact that it is custom made to order makes it very exclusive. Chances are that if You buy one, nobody else will have exactly similar watch. All this is reflected in the price which is well north of half a million SFr. As always, beauty is in the eyes of beholder. There are many watches that I think are not especially beautiful, but I acknowledge that they may still represent Haute Horologiere. First and foremost, apart from showing the time, about all the other functions of the Sidérale are totally useless. Though looking decent, it doesn't come near my "definition" of a beautiful watch. That it seems to cost around CHF 1.000.000, give or take some 100.000, is an absolute disgrace to me. This whole discussion of HH smacks of snobism of the kind I find intolerable, to be compared to polishing a wooden box with a lamb skin taken away from the lamb at a summer midnight at full moon at a mountain meadow at 2500 meter, and boiled in a mix of lavender oil and high quality Burgundy red wine for exactly 45,5 minutes, after which it is cooled on fresh twigs of rosemary, and softened by 10 year old girls rubbing the skin by their little hands until both skin and hands look purple. No need to take them too seriously, imo. These are just frivolities for the amusement of us. The fact that it exists and there is a market is reason enough. And of course the Siderale is HH. It's the definition of HH like a Patek grand complication. As far as the complications go, no one really needs anything other than hour, minute and maybe seconds and date. The rest, especially celestial complications are rare and difficult, IMO the definition of haute horology. The FHH (Fondation de la Haute Horlogerie) has established a white paper with the requirements to be considered haute Horlogerie. They use the term Fine watchmaking in English. A council of 42 experts in different field within the World of watchmaking meet a few times a year to discuss and review brands. They also visit the manufactures, and test the products. Every other year they publish a report to classify these brands within the guidelines of the White Paper. I am a member of the council.